A new, thoroughly updated edition of Bradt's Iceland, recipient of the Lowell Thomas Award (the highest travel writing award available in the United States) providing more context for individual places than any other guidebook, plus honest, investigative hotel and restaurant reviews that hide nothing. 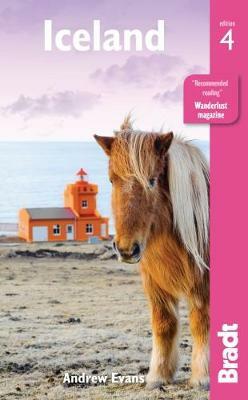 Based on 20 years of personal and business travel, exploration and adventure all around the country, Bradt's Iceland is in-depth, well-researched and comprehensive, featuring a year-round approach to travelling in Iceland in line with the development of the local tourist industry to offer attractions beyond the normal summer season. This latest edition covers the growing tourist infrastructure: the new, fully-paved road system, better routes through the interior, a wave of new hotels and resorts, more tour companies with more tour options, new adventure activities, plus day tours from port city destinations and tips for those travellers arriving by cruise ship. Natural history and wildlife experiences are featured prominently along with a focus on the outdoors and help in accessing even the most difficult corners of Iceland. Also featured is the most in-depth political and economic analysis offered by any guidebook since the turmoil of 2008. And, even though Iceland is notoriously expensive, there are now a lot more options for travellers, including more hostels, campsites, and budget airlines. This new edition also includes a foreword by the newly elected President of Iceland, Gudni Th. Johannesson. Containing information on remote offshore islands, the uninhabited interior and Reykjavik's bustling music and art scene, this remains the definitive guide.